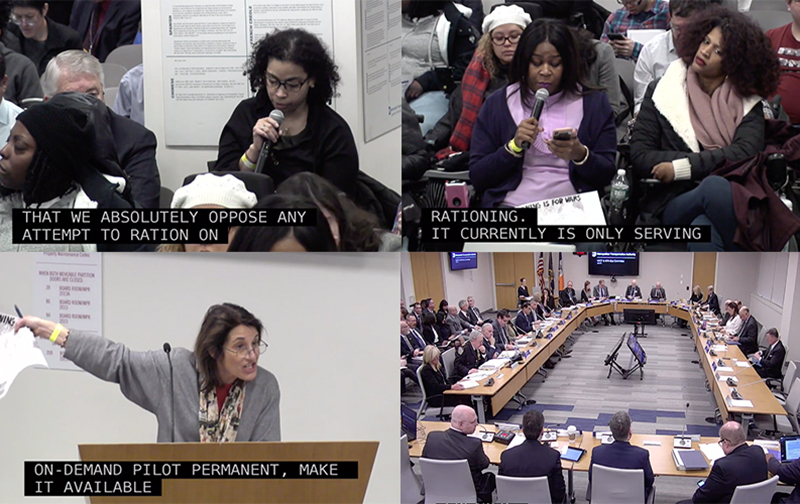 NYLPI and our colleagues in the Access-A-Ride Reform Group were out in force at Monday’s MTA Board Meeting to testify on a host of issues related to the on-demand pilot of the service. In particular, we raised concerns about the possibility that the on-demand pilot might be rationed. Good morning and thank you board members for hearing us today. We were here last month to express our concern about the impact an increase in the base fare would have on thousands of low- and fixed-income New Yorkers with disabilities who use the Access-A-Ride system as a primary means of transportation. And we are thankful that you all made sure the increase didn’t happen. We are also thankful that the On-Demand pilot will continue through the end of the year. But we want to make it clear that we absolutely oppose any attempt to ration On-Demand services. We are also here to voice our concerns about a number of service changes that appear to be happening with AAR. And I want you to understand how frustrating and scary it was to hear about actual, possible, and imagined changes from the newspaper, rather than from any announcements AAR made to their/your customers. We heard nothing. Yet the Daily News said the On-Demand pilot — that has been life-changing — was coming to an end. Imagine that. And why has it not been made clear that On-Demand rides are far cheaper than traditional AAR rides? The reason Access-A-Ride is needed is because of the inaccessibility of our current transit system. There’s no luxury about it. No chauffeur service about it. It’s federally funded paratransit, that is mandated by the ADA. And the service needs to be comparable to traditional transit services. Four hour trips to travel a half-hour route are not comparable. Having to make reservations 24-hours in advance is not comparable. And rationing services — which you would never dream of doing for anyone else — is not comparable. We will show up every single month until we get true comparable services — On-Demand and No Rationing. NYLPI Social Work Intern Jessica Champagnie testified next, and video of her remarks is available here. Good morning MTA Board Members. My name is Jessica Champagnie and I have been an Access –A- Ride passenger for almost 20 years. I am very grateful for the service. It makes it possible for me to live a productive life getting from point A to point B in New York City. I have dealt with being discriminated against by the MTA because of the widespread lack of elevators in the subway system. New York City’s subway system is one of the least accessible public transportation systems in the United States. Access-A-Ride is my only form of transportation. However, it has so many restrictions. The 24 hour advance reservation rule is unfair and discriminatory – something that would never be applied to people who are able to uses subways and buses. Why should there be advance reservations for my transportation? The On Demand Pilot program works much better and is way cheaper per ride than the traditional Access-A-Ride. I was elated to read in The Daily News, the extending of the Pilot until the end of the year. However, the pilot program should be available to all Access-A-Ride passengers without rationing. It currently is only serving less than 1% of the Access-A-Ride passenger population. How is that fair? I, by the way, am unfortunately part of the 99% who is not able to participate in the pilot. We also need honest transparency. The recent merger of the e-hail service and the broker car service has been very challenging for me. They are always late or never show up at all, meaning that an already unreliable service has gotten even worse for me. Lastly, no one knows what the future holds for them. I never thought at the age of 19 I would be dependent on accessible transportation in 2001. You or a family member, friend or colleague might need these services. I am asking MTA to stop the discrimination, make the On Demand service permanent and make it available to all Access-A-Ride users, without rationing. NYLPI’s Director of Disability Justice, Ruth Lowenkron, also testified, and video of her testimony is here. CityLimits Quotes NYLPI in Access-A-Ride Bus Lane Story CityLimits quoted NYLPI Director of Disability Justice Ruth Lowenkron in a story about a city proposal to let Access-A-Ride vans use bus lanes to speed up trips for riders with disabilities.